The Pettus family exemplifies this pattern. Sir John's grandfather (also called John) was a cloth merchant. His father Thomas was the first of the family to gain municipal honours being Sheriff in 1566 and Mayor in 1599. The memorial to him and his wife Christian is in St Simon and St Jude church. The family lived in Pettus house, which can be seen, much altered on Elm Hill. It is still possible from the street to view the extended joists on the first floor, a deviced employed in Tudor times to gain more space without buying more land. Sir John, knighted by Elizabeth I, was the first in the family to gain this honour. He was a merchant married to Bridget, daughter of Augustine Curtis of Honington. The family also lived in Pettus house.Sir John was Sheriff in 1598, Burgess in Parliament in 1601 and Mayor in 1608. During his year as Mayor he carried out various improvements to the fabric of the city including building a stone conduit to the spring by Bishop Bridge and also the fish stalls by Fyebridge - neither of which survive.Following the pattern of other families who amassed wealth Sir John bought an estate outside the city, in his case at Rackheath - where the family remained seated until 1722. Additionally he purchased land extensively throughout Norfolk and Suffolk. 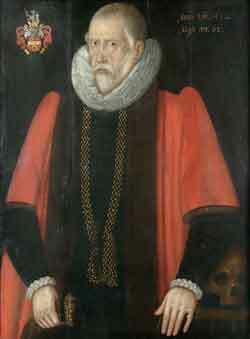 Sir John's eldest son, Sir Augustine, predeceased him leaving two infant boys Thomas and John, whom Sir John left to the wardship of his other son, also somewhat confusingly called Thomas, particularly directing him to protect his grandson John "from inferior places of learning to Cambridge". He was successful in the latter task. After graduating from Cambridge, John (the younger) married Elizabeth daughter of Sir Richard Gurney of Cheapside London who became Lord Mayor 1641 - 42. John entered the service of Charles I in 1639, and was knighted on 25 November 1641 as a mark of the king's favour to Gurney. His subsequent fortunes were somewhat mixed although he attained high military rank he also amassed huge debts which resulted in him being placed in a debtors prison so far removed from the wealth and position built by his grandfather. The monument, made from alabaster, combines different devices that were typical of the time. At the top of the monument Sir Augustine (died 1613) is depicted in a recess, knelt and facing his wife Abigail across a prayer desk. 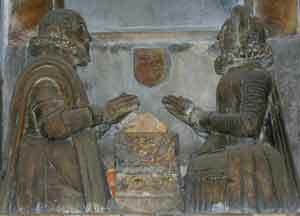 In the panel below Sir John's two sons and four daughters kneel facing each other. 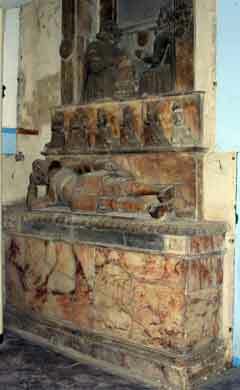 At the base of the monument Sir John lies, looking somewhat uncomfortable in a full suit of armour on a box tomb. Iin 2007/8 the monument was renovated as part of a £70,000 project funded through the Heritage Lottery Fund and other bodies including the Leche and Francis Coales Trust.